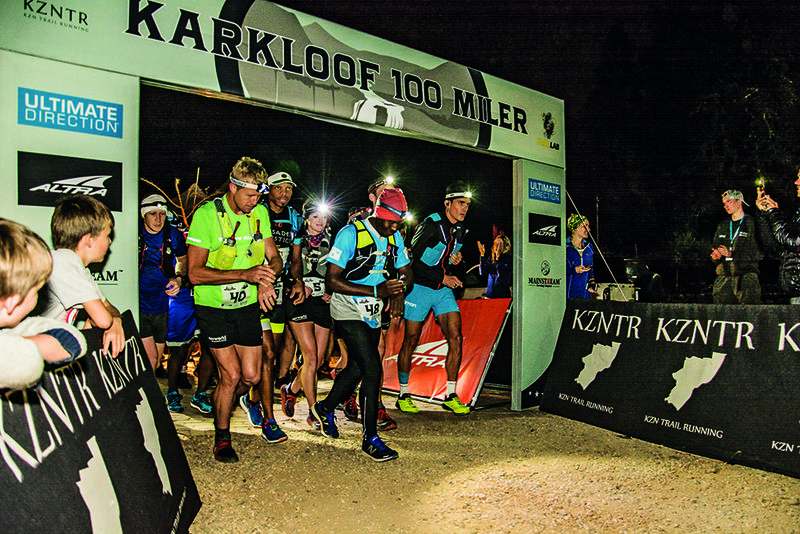 The Karkloof 100 is the first trail-running race in South Africa to ‘officially’ introduce pace setters in the second half. Here’s how podium finisher Andrew Erasmus used it to his advantage. After 100 miles of running in the rain, I expected even the top athletes would cross the finish line hallucinating, swearing, crying, crawling, cramping and vomiting. That they would utter a brief ‘hello’, and with that, curl up and lose consciousness for a few days. I had read about what happens to the ultra-human body when the soul seeks suffering and oblivion in the ‘pain cave’– and it’s not all zen. Only… this endurance race was different. 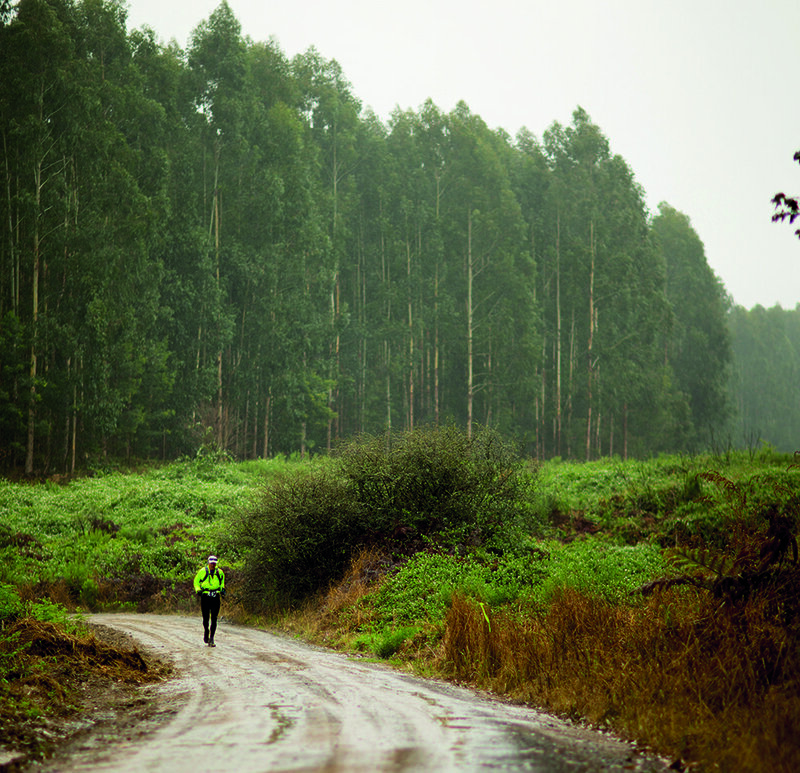 From the halfway turn at Karkloof, anyone chosen by the participant could join them, for any of seven specific sections or for the entire return journey. They had to wear a number and sign in, and weren’t allowed to push, pull, carry or mule [when a pacer carries food, water or gear for his or her runner]. 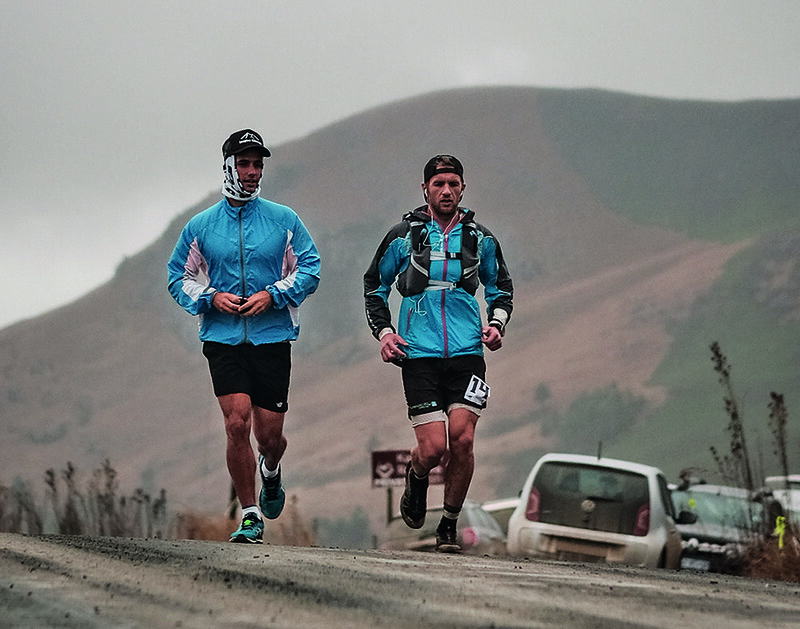 The elites were joined by running legends Kane Reilly and Ryan Sandes, who were acting as pace setters. Andrew Erasmus was a 100-mile first-timer, who race organiser Andrew Booth admits wasn’t even on his radar as a strong contender for a podium finish. Yet in a surprising turn of events, he came second, behind experienced endurance athlete Bennie Roux. Here’s how he and his fellow participants used pace setters to their advantage. Erasmus ran with his brother and fellow participant Steven during the second half – it’s difficult to tell the brothers apart. For all we know, they could easily have swopped halfway! Not everyone is fortunate to have their own flesh and blood pace them, but someone who knows you well is your safest bet. One runner even had his 11-year-old daughter run a section with him. Best mate and running buddy Craig George paced eighth-placed Al Leslie. “I know Al very well. I knew when I was irritating him, and I backed off. When I thought I was going too fast, I let him run in front. When he was vomiting, I let him do it. Once all the soup was out, we set off again. When he faceplanted on a wobbly bridge, I encouraged him to get back up again, by convincing him he hadn’t actually broken all of his toes. I didn’t let him walk for too long. I would say, “Come on, let’s jog. Andrew Erasmus: “Kane Reilly and Steven both knew I needed to control my pace and be in front. I needed them to remind me to eat and keep warm.” Holding back can be difficult for pace setters who are used to racing hard. Had he not had a pace setter by his side, Erasmus might have found it difficult to run the negative split he eventually ran at Karkloof. Here’s why: when I first met Erasmus at last year’s SkyRun, he confessed he too finds it difficult to hold back. In the past, Erasmus’ fast starts usually meant he ended up bombing out. But experience has taught this young colt a thing or two, and he paced this race perfectly. Erasmus’ strategy began at the start, and in the second half of the race, a pacer was allowed to help him. “I ran with fellow participant Al Leslie (who finished in eighth) for the first half,” says Erasmus. At the halfway mark, the pair were joined by Erasmus’ twin brother and pacer Steven, at which point Leslie dropped back. When you’re pushing through a section that seems impossible and you’re feeling tired, Booth says, you need your pace setter to make important decisions on your behalf. Some people hallucinate when they run long distances; or they go quiet, and their sentences trail off. Pacers need to know what to do when their companion is losing it. Erasmus said he could see his wife driving her car through the forest. 1. Don’t race your runner. Many runners like to be in front. If your runner is like this, stay back – unless it’s a good time to push the pace. 2. Leave your ego at the door. It’s your runner’s race, not yours! Think as your runner and not yourself when you’re making decisions. 3. Keep it light-hearted. Running that far comes with highs and lows. It’s easy to starting thinking, Why on earth am I doing this? It was at these moments I had to keep Andrew psyched – or happy, at the very least. 4. Make sure you don’t blow! I have heard of pacers getting into trouble themselves, and their runners having to help them out. I had to remind myself to eat a couple of times. 5. Be sure to have a beer waiting at the finish! That’s self-explanatory. What pacers do brilliantly is keep you abreast of the competition. “When we spotted [eventual women’s winner] Naomi Brand, and Steve said, ‘You’ve got this, you can catch her’, I suddenly felt like an Olympic athlete,” Erasmus recalls. Pacers can make or break a race. Cajoled at the wrong time, an exhausted ultra-runner might call it a day – or a dark night – curl up, and go to sleep. One runner did just that at kilometre 135 in the Karkloof 100. His desperate pacer got his wife on the phone. She let him have it. She told him lying down in the rain was not an option – not with three kids and all that training. So he got up, made it to the aid station, had a sleep next to the fire and then carried on. A 36-hour classic race, made easier by the removal of obstacles and support for athletes. Winner of the women’s race Naomi Brand described the route – which starts in Howick and winds its way through nature reserves, forests and farmlands – as exquisite. Checkpoints are spaced 17km apart, and there are pacers, food and medicine in abundance. Your chances of altitude sickness or tripping over treacherous mountain rocks are slim – most parts of the route can be accessed by vehicle. “The route is modelled on 100-mile races in the US: it’s runnable, there aren’t huge amounts of elevation, and it flows,” says race organiser Andrew Booth. It was out-and-back, which meant runners could remember the sections they had already run and knew what to expect on their return. The 50-mile (80km) version was run at the same time, which made for a bulkier field and encouraged camaraderie. Husbands and wives were permitted to wait for their runners at every aid station. “The route accommodated supporters brilliantly,” observed winner Bennie Roux. 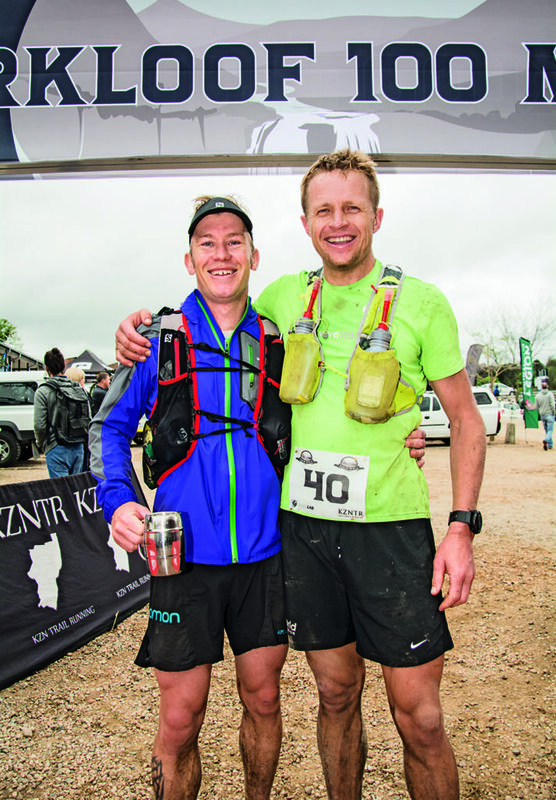 Eramus’ training enabled him to stick with both his pace setter and the leading pack in the second half of Karkloof. During the six weeks leading up to the race, he had ticked off between 160 and 230km per week. His weekends were spent running 50 to 80km, back-to-back. Three weeks before the race he reduced his mileage to 80km per week of easy running. “My preparation didn’t just involve running; my strategy involved working out what and when to eat and drink. Bennie Roux and I followed each other on Strava, which meant I could see that he was doing a similar programme,” says Erasmus. During the first half, Erasmus ran at a conservative pace: 6.00/km. Then he began to slink forwards, gradually closing the gap. First, he picked off eventual women’s winner Naomi Brand. “Andrew suddenly came flying past me!” Brand recalls. “I was so angry. That and a Red Bull kicked in, and I ran the fastest I could to catch up with him, racing flat out to the finish,” said Brand. Then it was Roux’s turn. Erasmus, Roux and Brand were embroiled in a game of cat and mouse, chasing each other through the trees and the relentless rain, and sprinting towards the podium. “In the end, Bennie was pushing hard, looking back every 15 seconds. If nobody had warned him Andrew was hot on his heels, the race might have had a different winner,” says Booth. It was nail-biting stuff: the three athletes finished minutes apart – Roux in first place (his time: 18:09.21), Erasmus in second 18.13.08) and Naomi Brand in third (18.18.03). Erasmus was the only athlete to have run close to a negative split, thanks in part to the expertise of his pace setters. The backmarkers finished at various stages during the second night; the last one appeared at 7am, well within the 36-hour cut-off. Some were moody and broken, others were relieved. Beer was served, and Brand happily slurped the milkshake she’d requested.